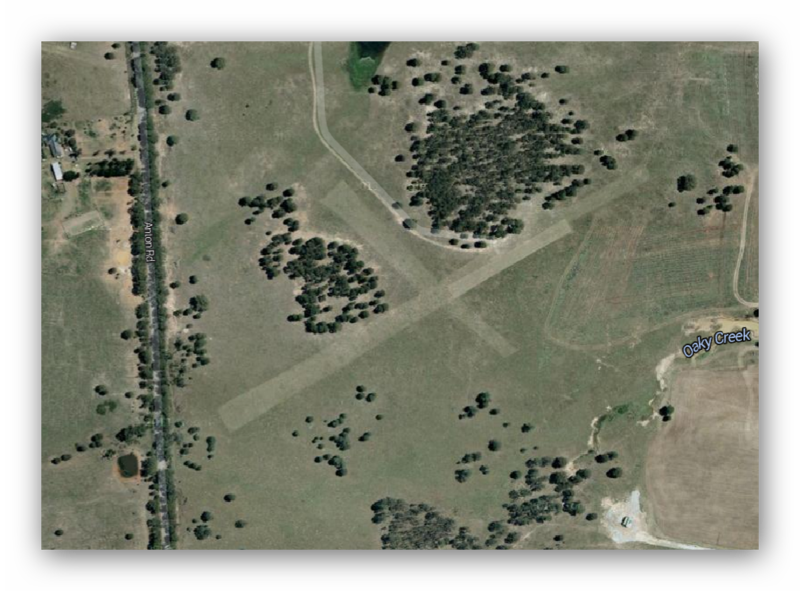 Secrets of a Sydney past: Is this the ultimate Badgery's Creek runway configuration? Well, yeah, probably! Is this the ultimate Badgery's Creek runway configuration? Well, yeah, probably! I'm not sure if the grass can handle the strain, but I like the design (image via Google Maps). No, it's not the actual layout, of course. But the final EIS does tells us a lot more. Brave, committed and motivated people with plenty of spare time can read that at their leisure. It's worth it. Below is a little detail, condensed from those documents. When I write "Badgery's Creek" I mean "Western Sydney Airport". When I write "SAP" I mean the existing international and domestic airport at Mascot. You know the one I mean. Stage one is underway, with preliminary road closures and the like, but operations are unlikely within 10 years. It's just one runway, aligned 05/23 with a length of 3,700m. That's to say it points roughly north-east to south-west and is long enough to handle heavily-laden international operations. It's slightly shorter than what we have today (at SAP), but more modern aircraft tend to need less runway. 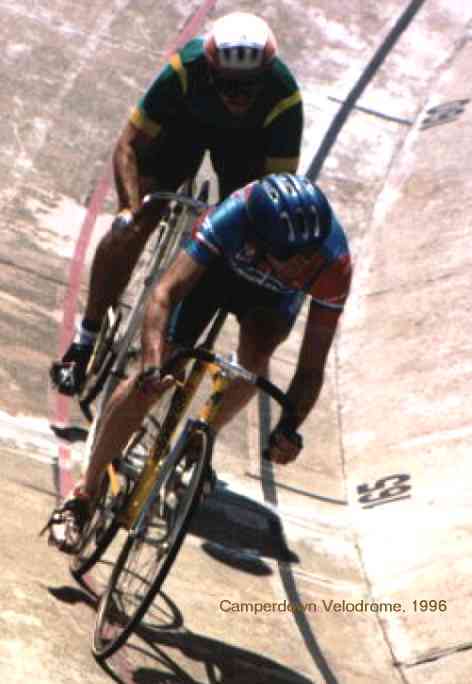 All images from the EIS linked above, by the way. And they are "indicative". Get used to that word. 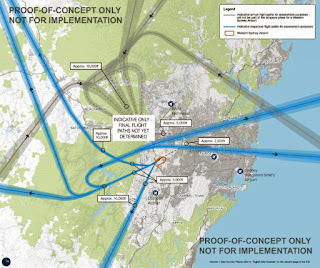 Aircraft will turn and dodge around the most obvious population centres, and there is a commitment of sorts that no one convergence point over any one residential area will be used, and especially not Blaxland. So there is some fairness in sharing the noise around, in principle. It is planned to be a 24 hour operation but with a noise abatement preference for arrival and departure operation over the south west at night, when possible. Weather permitting. 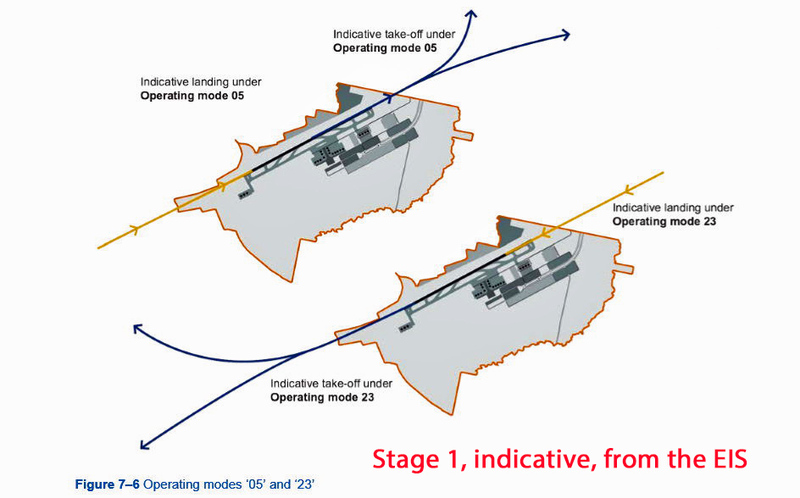 The above shows indicative flight paths with runway heading 05. And this shows indicative flight paths with runway heading 23. Stage two would add another wide-spaced runway (almost 2km away, or a lot more than the current squeezy Sydney Airport spacing). It would be parallel with the stage 1 runway, but is probably 30 to 40 years away, if it happens at all. The original runway becomes 05L/23R, which is to say the second runway is built to the south and east of the first one, with the terminal infrastructure sited in-between. Everything else, or actually just about everything until the point when runway concrete is poured, is still up for grabs or "indicative". The shape of terminal areas and hard-standing is not fixed, for example. Approach and departure routes will inevitably evolve, as will noise footprints. Technology will change, too, allowing for more precise control over aircraft movements, and who knows what will be flying in the mid-2020s, let alone by 2050. It is also hard to be certain about demand over time. It looks like a go-er, sure, but many airlines will be reluctant to move away from Sydney (Kingsford Smith) Airport (or SYD or SAP or even YSSY if you prefer to call it). 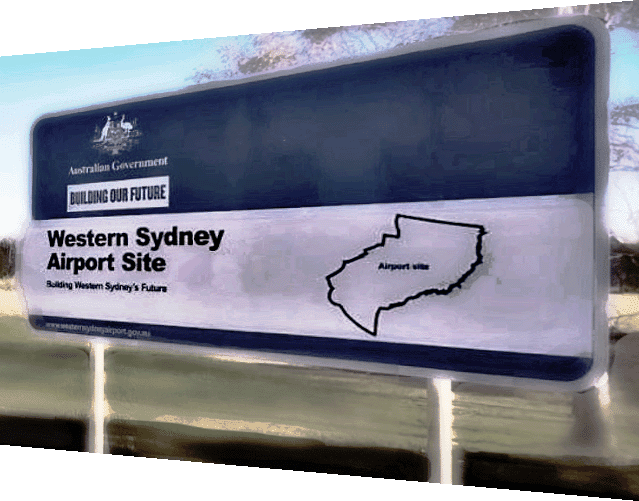 Whilst western-Sydney travelers will naturally be eager to avoid the slow trip to SAP, it will possibly take some persuasion to shift even a representative selection of flights to the new airport. Regionals will be reluctant to move first, especially without an express rail or even a direct motorway back to SAP. Cargo (or freight, if you prefer) may be a more likely early adopter. General aviation, corporate and helicopters are not in scope - yet. To make it work, however, would suggest opening it up to as many options as possible. Transport links are thus critical, especially if an integrated operation with the current SAP is desired. Imagine landing at SAP after a long-haul international flight, only to face a painful and expensive drive to connect with a domestic flight to wherever out of Badgery's Creek. It's possible rather than desirable. But much of the current infrastructure planning for Sydney is focused on better connecting the city's CBD with the north-west and east, mostly using metro and light rail. At best the metro rail wraps around to Bankstown via Sydenham. Much of that is underway now, but extending westward beyond Bankstown is moot. Making anything like a seamless rail link to Badgery's Creek is currently just talk, however the term "rail ready" has been bandied around. That currently means heavy rail, but not a direct link, unless you start from, say Liverpool and go via Leppington. 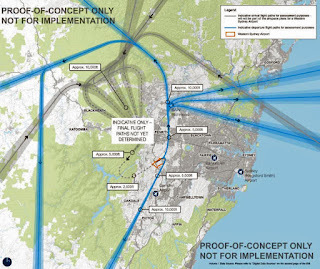 More a loop or a spur, at least initially, although cobbling together a heavy rail link from SAP via Arncliffe, East Hills and Leppinton is probably most likely, if that means anything. Other heavy rail links are also possible, linking to the north. How that meshes with the currently fashionable metro concept is another matter again. It basically doesn't. 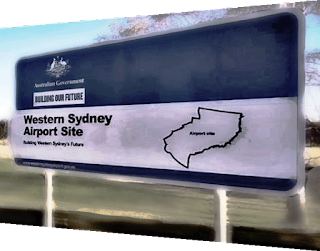 In the south and western area of Sydney we do see some roads being widened, and more planned, with an eye to increased access to what will be a new airport and adjacent industrial area. But in other respects the most likely western-Sydney projects (both metro and light rail) are still in development, and will end in or around Parramatta. And then a bus after that, I guess. 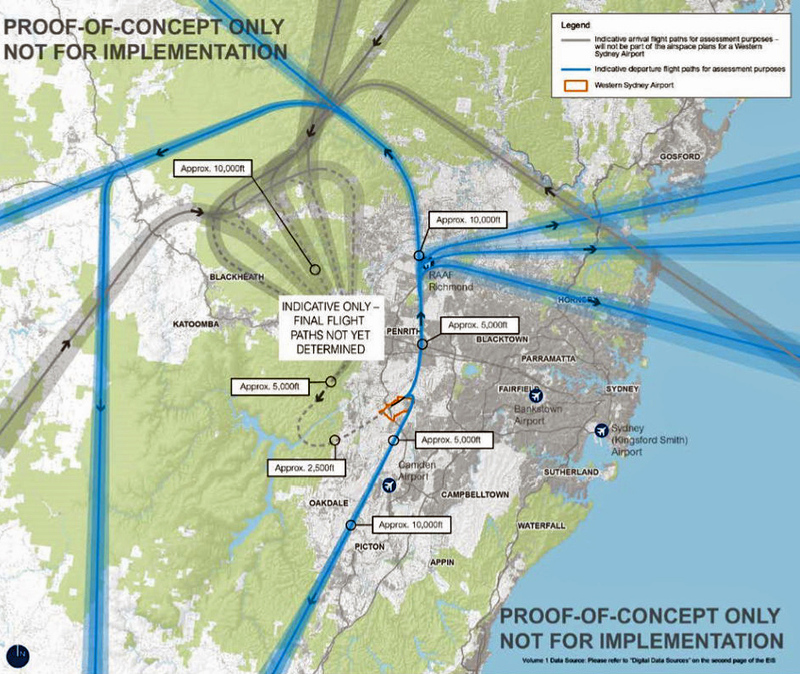 At this point we can't really say that a Badgery's Creek airport would have anything faster or more effective than bus and car access at this stage. Even the aircraft fuel will be trucked in. Will this change? Possibly. What part will any proposed fast rail line play in this? We don't know. There are so many variables, so many questions.